One of these little pillows makes any trip more pleasant. You can use one to catch a few winks on a plane or put behind your back when it's tired from driving. Send your college student off with one. Make the pillow case in school colors. These smaller pillows are just the right size for kids to take to day care for nap time. Expectant mommies love these to prop legs and knees to get comfortable at night. The finished size of these pillows is 18" X 12", and the pillow cases are made to fit them. This size pillow is also a common size that you can purchase ready-made, so you can make the pillow case to fit a purchased pillow form if you'd like. 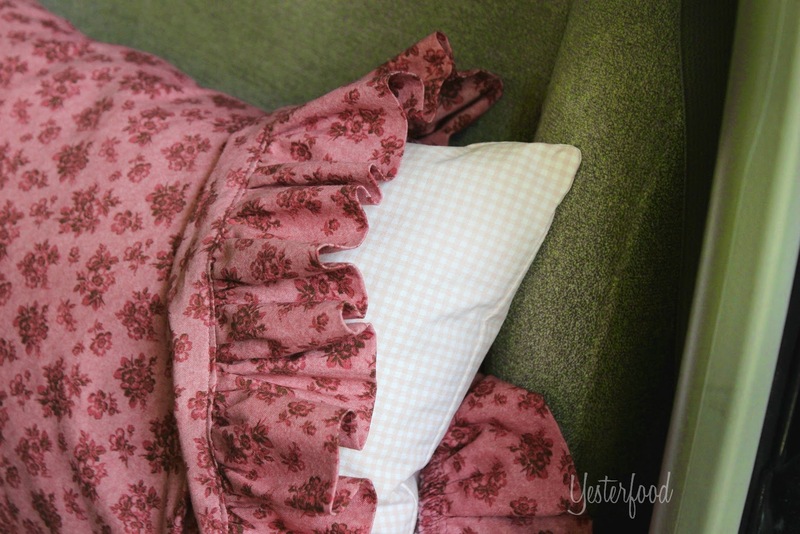 ...and used pink gingham for the body of the pillow. You'll need about a little less than a half yard of 45" fabric for the pillow. 1. To make the pillow, cut 2 rectangles, 19" X 13" each. 2. Right sides together, and using a 1/2" seam, sew three sides together, leaving one 13" side open. Finish the raw edges of the three sewn sides with zigzag stitching if desired. 3. Clip the two sewn corners. Press seams open. Press under 1/2" of the unsewn edge. 4. Turn pillow right side out, and stuff to your desired firmness with polyester filling. I use about 6 ounces per pillow. 5. Your open seam should have 1/2" pressed under from step 3. Put these edges together and pin. Stitching close to the edge, sew the edges together. You could also slip stitch this closed by hand if you'd like. Your pillow is done! Now make a cute pillow case for it. Step 5: Stuff pillow, then sew the open end closed. You'll need about a half yard of 45" fabric for the pillow case. 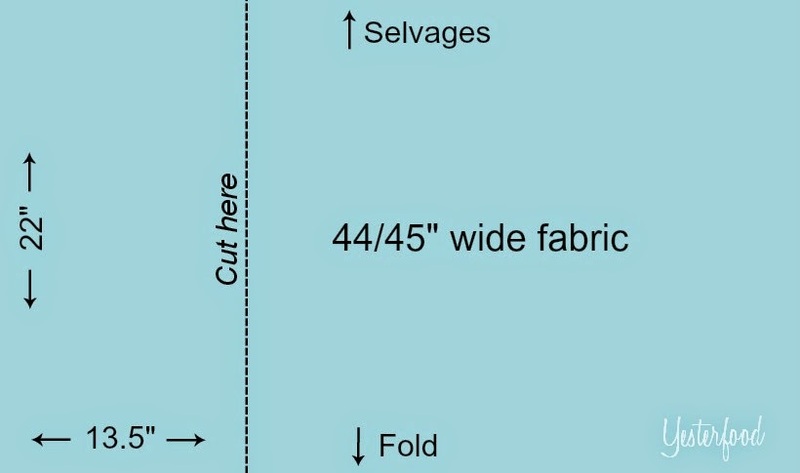 How your cut will look with actual fabric. You can get 3 pillow cases from about 1.25 yards of fabric. 2. You now have a piece of fabric that is 13.5" wide and about 44" long. Fold with right sides together. 3. Using a 1/4" seam, sew the two longer sides closed. Finish the raw edges with zigzag stitching. 4. You now have one edge open. This is where the pillow will go in. Press under 1/2", then another 1". Stitch close to the edge. Turn right side out and press. 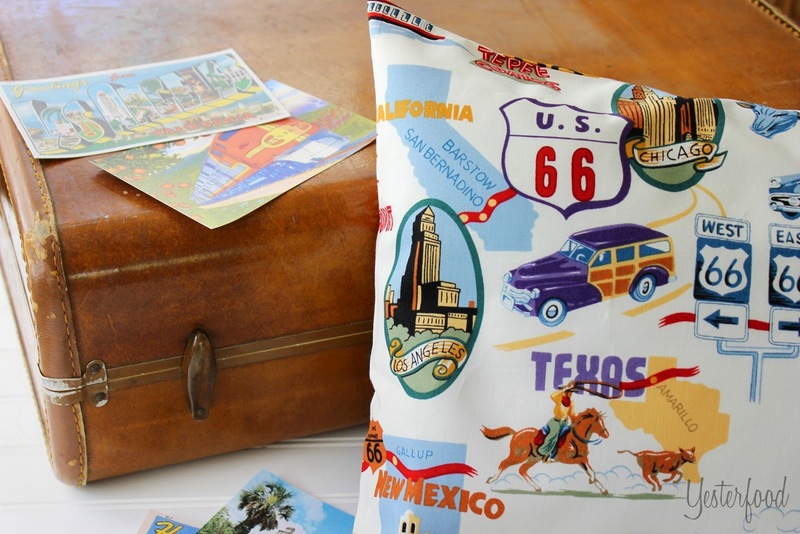 You now have a great new pillow case for your travel pillow! Finished side seam and hem, steps 3 and 4. Travel Pillow may have been taken to some of these fun parties. What a cute idea! It would be great to just have a couple of those in the back of the car for when little ones get tired! Pinned to my Gift Board. This is such a great idea and summer time is the perfect time for a travel pillow. I have two travel pillows that we leave in the car. They look like they are the same size as this one. They could really use another pillow case. Thanks so much for sharing! Nice simple tutorial - and you've got some great fabric there!! Joy- this is super cute! 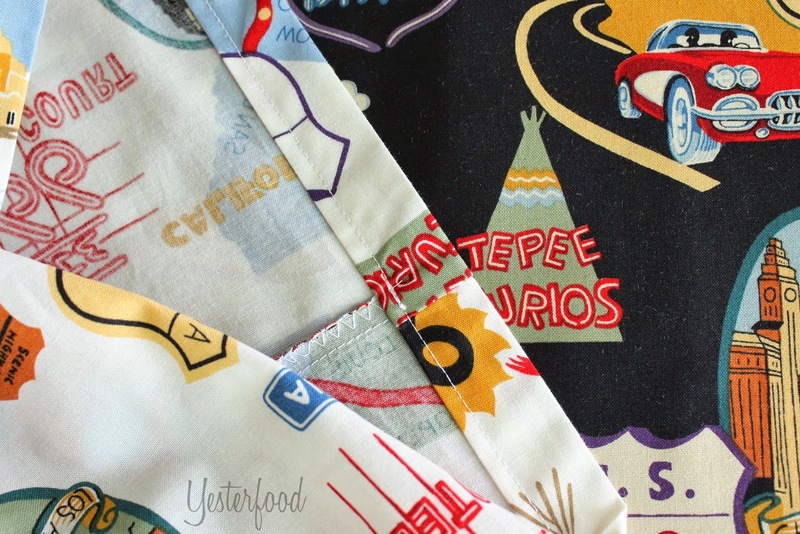 And I love the roadtrip-inspired fabric! Thank you so much for linking up to Snickerdoodle Sunday- hope you'll come back again next week! What a cute idea! I love how easily they can be customized too. Thanks for sharing. Pinning! My son would be all over this fabric! So fun! I would love to have you link it up to my Feature Friday Link Palooza! What a great space saving idea! I would love for you to share your project on my Meet Up Monday Blog Party! Cute and clever idea. The grandkids would like these when going on long trips. Thanks for sharing at What'd You Do This Weekend, Joy. 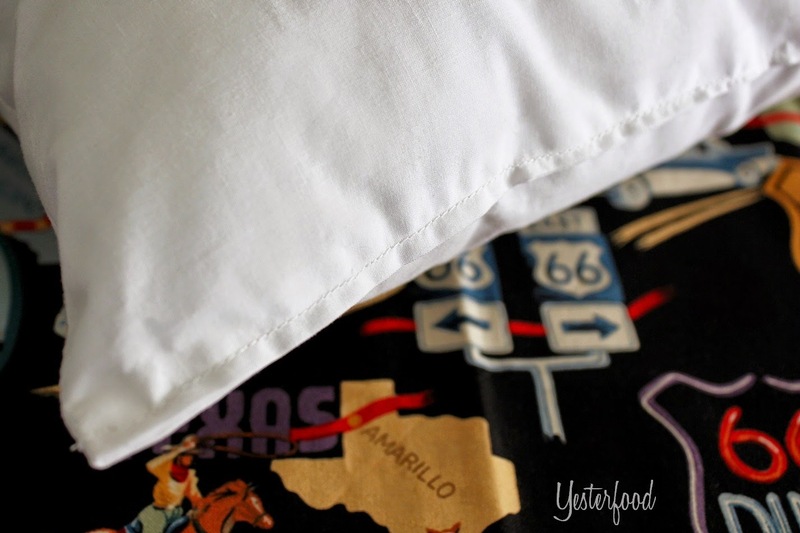 Such an adorable idea and i am loving the ruffled travel pillow! the design possibilities are endless. The kids would have a ball choosing their fabric and then seeing their pillow come to creation. Great idea! These are really nice, and what a great gift idea!!!! These are such a good idea, Joy! Great tutorial! Hi Joy, what a great idea for traveling on the plane or in a car for the little ones! I like the fabric you used too! These are so cute and you made it look so easy! This is a great idea, especially for gifts... They can always take a little bit of you with them! Thanks for sharing. Pinning! Cute pillows! I love the one with the Route 66 fabric. This is so adorable! I love it! I would be honored if you would come share this awesome tip at Pin Your Friday Favorite! The party goes live tonight @ 10pm EST. I make pillow cases and have given some to my grands, but I love the size of this one Joy! 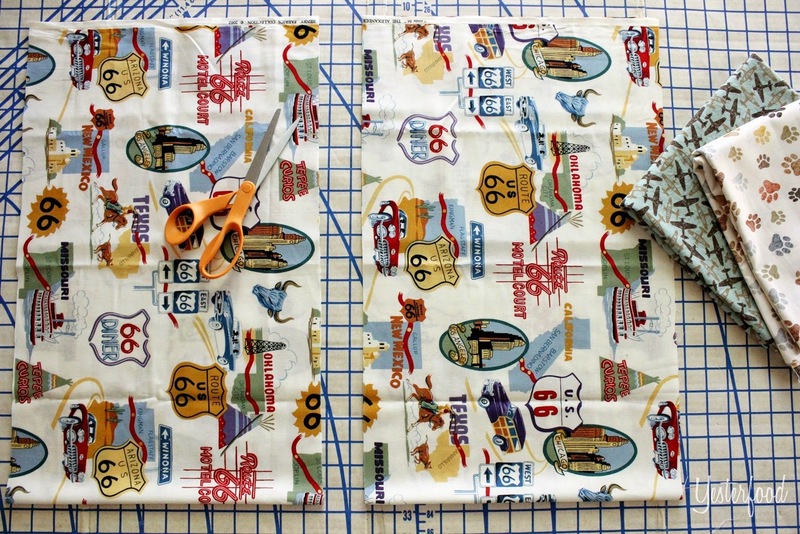 The Route 66 and cowboy fabric is darling! Thanks for sharing them with SYC. Even teenagers love travel pillows! Good post...thanks for sharing with the Thursday Blog Hop! G'day! Thanks for sharing at our #SayGdayParty! Pinned! 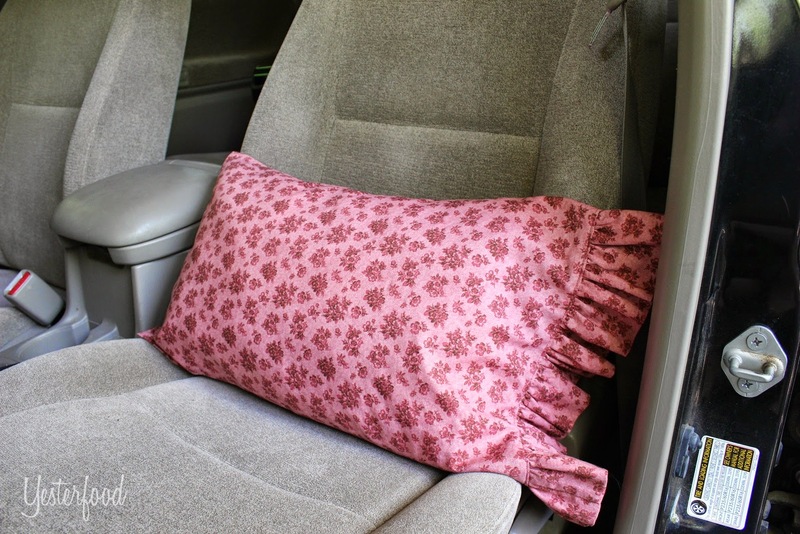 This is a great sized pillow (or cushion as we call them in Australia), for the car. Love the asymmetrical ruffles on your Mom's pillow, Joy. Super cute idea! Should make some for our family trips! Thanks for sharing! Love this adorable pillow. I can't go on any long drive without having some kind of pillow for a quick little cap nap. This one would be the perfect size. Thanks for sharing, Stopping by from Share it Saturday. 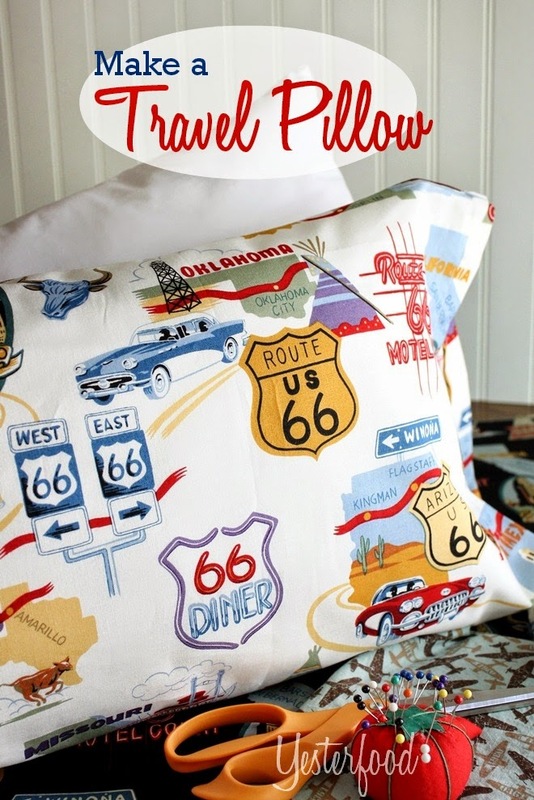 I love the Route 66 fabric! Such a great pillow. Such a cute idea! Thanks for sharing it with us in the Bloggers Brags PInterest Party! Come again soon! I like the helpful information you provide in your article. I will bookmark your weblog and check again here frequently. Great article. It's really cute.